About I Dig Archaeology! - I Dig Archaeology! IDA is an interactive, hands-on education program where the wonder, excitement and practicalities of archaeology are ripped out of dusty old textbooks and brought to schools for students to experience for themselves. Our programs deliver an authentic and potent learning experience for students of all ages. In our feature program, the simulated excavation, a carefully prepared 'site' is brought to your school for students to excavate. Students will be active participants in the archaeological process by learning and applying genuine archaeological excavation and recording techniques: they will excavate, record, recover, analyse, interpret and publish archaeological material, all using the latest digital and other technologies. "In a Near Eastern Bronze Age community, the last stones are positioned to seal her final resting place. In the tomb, all is quiet. She lies curled on her side, adorned from head to toe in strings of beads and copper and bronze jewellery befitting her rank. Clutched in her hand, close by her face, is an atacamite pigment shell, held as if she is ready to apply the pigment to her eyes one last time. All around her lay the items that have been offered to mark her passing: locally made ceramic vessels, ceramics and stamp seals traded from distant western Asia, shells and jewellery, ostrich egg vessels, and food offerings of barley, dates and shellfish. Outside, those mourning her death hold a last banquet of goat, lamb and fish, honouring the deceased. In this way, life and death are intertwined." With the IDA program, students and teachers have the best of both worlds: a pedagogically sound program which has been nurtured and developed by a practicing history teacher; which is also expertly delivered by a qualified and experienced archaeologist (both of whom just happen to be one and the same person!). In an exciting new addition to our simulated excavation program, IDA is introducing a dig with a distinctly Australian flavour. From late 2014, schools can choose to participate in a simulation replicating colonial Australia: an ex-convict hut from the early 19th century. During the excavation, students will encounter the only semi-permanent remains of the wattle and duab hut - a few courses of the sandstock brick fireplace. 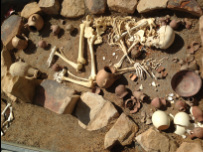 In the occupation deposits found in and around the fireplace, students will unearth locally made and imported ceramics, clay pipes, coins, children's toys, metal objects, animal bones, charcoal and other forms of material culture, which they will use to examine life in the early colony. In one area of the site, students may also encounter evidence of the first Australians. "Mary sighs and looks one last time around the wattle and daub hut that has been her home for the last five years: the sandstock brick fireplace, packed earth floors, palm trunk walls and wooden roof shingles were worn, sagging and ultimately doomed. Her house, and the life that she had made since finishing her convict sentence, was soon to be knocked to the ground, to make way for a fine new brick building here in Rose Hill. She walks through the door, leaving behind the precious few, but now broken or unusable, personal possessions of her family." Excursion planning can be burdensome; complex risk management, organisation of transportation, and documenting the educational outcomes for the day. A range of support resources have been developed to assist IDA schools, removing this burden. A comprehensive risk management proforma, archaeological day plan (including syllabus outcomes), incursion schedule, safety information and student activity books and assessments are all made available to participating schools in the Resource section of the website. Please take some time to peruse the pages on our site. Here you will find the nuts and bolts - all the detail you need to understand the ways in which the program can benefit your students. If you have any queries you can use the Contact Form on the site, send an email to idigarchaeologyeducation@gmail.com, or speak directly to program director Melissa Riley on 0407773094. The 'sites' which have been designed for the program have been meticulously planned and executed so as to deliver a controlled and even matrix (thus ensuring a meaningful and memorable learning experience for students, without the frustration and disappointment that can occur on an archaeological site which yields little cultural material). Having said this, the sites are not overly 'salted' unrealistically with material culture. Neither of the two sites offered in the program are direct replicas of any specific archaeological site. The material assemblage in the Near Eastern tomb is generically similar to material culture that can be found in the Arabian Gulf region during the 3rd millennium BC, including evidence of trade links to western Asia during this time, but no specific site or culture is copied. This approach ensures that potential pitfalls such as cultural misrepresentation (even inadvertent) or oversimplification are avoided, and maintains the focus of the exercise on the archaeological process itself, rather than the cultural content. A different approach, however, has been taken in the design of the new simulation being introduced in 2014. In the context of the NSW late Stage 2 and Stage 3 curriculum, where the prescribed knowledge of the archaeological process need only be fundamental, cultural content must take on a more significant role in the simulation. Therefore, whilst again no specific site is replicated, the material culture of early 19th century colonial Sydney is. This strikes a far better balance for younger students between content and process, and ensures that their participation in IDA is meaningful.